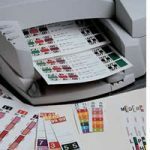 The JeterBreeze™ system produces color-coded strip labels with brilliant standard or custom colors, an array of text options, and high-resolution sequential and non-sequential bar codes - on demand! JeterBreeze on-demand labels make managing large filing systems less labor intensive and virtually eliminates misfiled documents. Integrate JeterBreeze labeled folders into your current filing system with exact visual and color match, or create a new filing system tailored to your organization's needs. 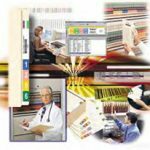 JeterBreeze is the perfect solution for high-volume filing departments or any company that wants an easy way to generate color-coded strip labels on-demand. We can create your custom designs for you - it's that easy. JeterBreeze is an easy to use label printing software package that lets you produce personalized color-coded file labels right from your computer on-demand. With JeterBreeze, you can print brilliant color-coded labels complete with personalized bar codes and graphics, from any location, so you get the labels you want, when you want them. Available in both Desktop & Internet versions. JeterBreeze is simple and easy to use. Utilizing latest available technology, JeterBreeze delivers the same high quality, custom labels you expect from Jeter, with the ease of printing on-site. After printing, the Jeter label remains flat and easy to apply. In folder conversions, the Jeter strip label repairs and reinforces damaged folder tabs, making them stronger and extending folder life. JeterBreeeze offers the versatility you expect from Jeter, produced right in your office, within your budget, without sacrificing quality or service. Color-coded filing systems have proven to be the most efficient method of organizing hard copy documents, dramatically reducing filing and retrieval time and preventing misfiled records.JeterBreeze improves the efficiencies of color-coded file identification by enabling you to automatically generate printed strip labels directly from your host data using a desktop color printer. As a recognized leader in the records and information management industry, we develop custom solutions that enable our customers to control, store and access critical information. We offer top quality filing systems, media storage equipment and specialists that solve complex records and information management challenges. With years of experience, we serve clients in a variety of industries including legal, finance, healthcare, insurance, manufacturing, education and government.